Ludwig is the most recent character to emerge from the work of Italian artist Diego Marcon. 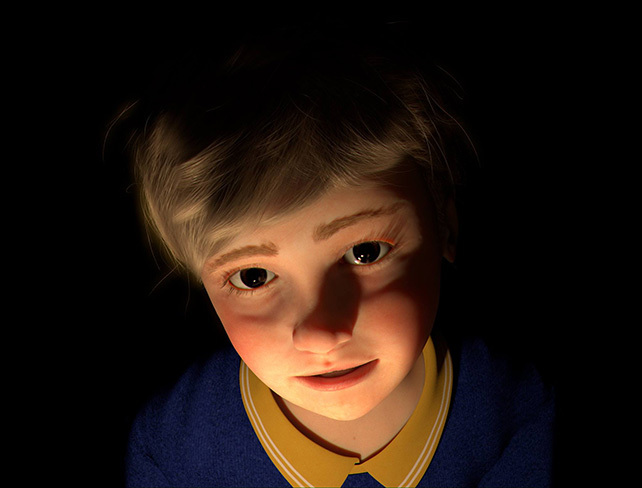 Marcon chose CGI (computer-generated imagery) to compose ‘Ludwig’, whose namesake protagonist is a lone blond boy with dark eyes confined to the pitch-black bowels of a ship at sea. Chiaroscuros—the contrast of light and shadow—are replayed as the animation loops endlessly. Ludwig sings an aria that observes the European Romantic musical tradition of the lied, usually a composition about lost love, death, night or dreams. The score was written by Marcon’s collaborator, Federico Chiari, and sung by a boy soprano from the prestigious Coro di Voci Bianche dell’Accademia Teatro alla Scala in Milan. The images and the song’s refrain each magnify the work’s unsettling effect—the combination of animation and classical music is jarring. ‘Ludwig’, the exhibition, presents only a 2-metre wide, six-monitor video-wall which plays the video on a loop. The display reflects the hyper-technological forms of visual advertising ubiquitous in Singapore.